In the USA, a manufacturer of seasonings and marinades was experiencing tremendous growth due to its unique flavour profiles. It approached process equipment expert APEC to enquire about a system that would allow it to make more product, reduce the labour associated with hand scooping of ingredients and at the same time maintain a high level of security so the recipes could only be accessed by a few trusted people. The application required that the finished batch of spices would get transferred to either of two mixers, depending on the formulation. After mixing, the spice recipe would then be transferred to other locations for further processing. APEC worked with the customer to evaluate the various ingredients to make sure that they would flow and that the appropriate feeder would be selected to maintain the desired accuracy for each ingredient. A solid core stainless steel auger in a stainless-steel hopper sized for each ingredient was selected. These were ground and polished to a food-grade finish. During testing it was found that two of the ingredients had difficult flow characteristics so mechanical agitation was added to these hoppers. To have a scale that was small and accurate to two decimal places with the ability to discharge into two different mixers and be fed from 10 ingredient hoppers, an indexing scale with a 25kg capacity was chosen. This gave the scale the ability to move under the appropriate feeder for filling and then move to the appropriate mixer for discharge. This also kept the height of the system to a level that would fit into an existing facility. To make sure that the correct ingredients were used in each bin, a bin lock system was used in conjunction with the product bar code. When the ingredient barcode is scanned the bin that is assigned to that ingredient is unlocked for filling. This also enhanced the system security by limiting access to certain people. APEC used a recipe automation program that utilised a secure operating system designed for real-time, mission-critical applications. This added an extra level of security to the system. APEC worked with the customer to select a mixer that would mix in the required time and was equipped with automatic filling and discharging. 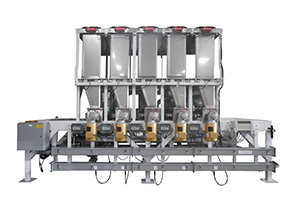 The company also designed an interface between the mixers and a frame that would hold the bag during filling. To keep the system and surrounding area clean, a compact dust collection system was designed. The final system that was delivered was pre-wired and pre-tested as much as possible to simplify the installation process. Each recipe was electronically entered into the system by the owner to maintain security. As a result, the customer is now able to automatically weigh and mix the spices and at the same time maintain a high level of security. A production record with lot tracking gives the manufacturer the ability to simplify record keeping. The system has reduced manual labour and exposure to the ingredients and will allow the company to keep up with future demand for its products.